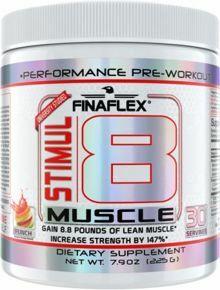 As a dietary supplement, mix 1 scoop of STIMUL8® MUSCLE with 8-16 ounces of cold water and consume 15-30 minutes prior to workout. DO NOT consume more than one scoop of STIMUL8® MUSCLE daily. 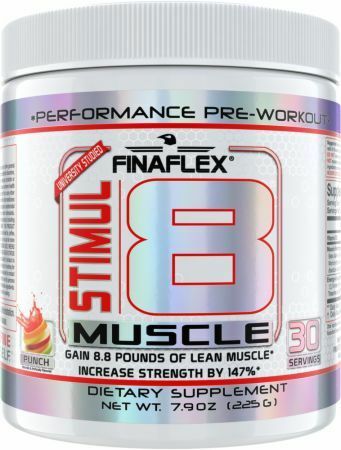 DO NOT exceed recommended dosage due to the extremely potent nature of the ingredients contained in STIMUL8® MUSCLE. SO NOT USE FOR MORE THAN 60 DAYS CONSECUTIVELY. KEEP OUT OF REACH OF CHILDREN. DO NOT USE IF PREGNANT OR NURSING. Consult your physician prior to use if you have or at risk for prostate disease, heart disease, or any other general medical condition, including but not limited to, heart, liver, kidney, or thyroid disease, psychiatric or epileptic disorders, difficulty urinating, diabetes, high blood pressure, cardiac arrhythmia, recurrent headaches, enlarged prostate or glaucoma. DO NOT EXCEED RECOMMENDED DOSAGE. Exceeding recommended dosage may cause adverse health effects. All persons are advised to consult with their doctor or other medical authority before use of this or any other dietary supplement. Discuss possible interactions and contradictions of this dietary supplement with other medicines currently prescribed by your doctor, included but not limited to, MAOI inhibitors, antidepressants, asprin, nonsteroidal anti-inflammatory drugs or products containing phenylephrine, ephedrine, pseudoephedrine, or other stimulants. Discontinue use immediately if you experience any adverse symptoms or reactions while taking this product, including but not limited to, rapid heartbeat, dizziness, severe headache or shortness of breath. WARNING: THIS PRODUCT CONTAINS CAFFEINE. Do not consume synephrine or caffeine from other sources, including but limited to, coffee, tea, soda and other dietary supplements or medications containing phenylephrine or caffeine. Do not use for more than 8 weeks consecutively. DO NOT USE THIS PRODUCT IN EXTREME HEAT CONDITIONS. DISCONTINUE USE 2 WEEKS PRIOR TO SURGERY. DO NOT COMBINE THIS PRODUCT WITH ALCOHOL. DO NOT USE PRODUCT IF YOUR HEALTH STATUS IS UNKNOWN. DO NOT USE THIS PRODUCT 5 HOURS PRIOR TO BEDTIME. Consume assumes all liability if product is used in a manner inconsistent with label guidelines. CAUTION: Athletes or other persons who are subject to testing for performance enhancing drugs may test positive when using dietary supplements. All persons are advised to contact their drug testing organization prior to use of this or any other dietary supplement. Not intended for use by persons under the age of 18 years old. Contents may settle in transit. Shake container prior to use to redistribute ingredients. Store in a cool dry place (heat and humidity can cause clumping). Do not discard desiccant pack after opening. Apple This is a Buy 1 Get 1 FREE offer!